Alonso Duran was born in Grecia, Costa Rica. After studying engineering for several years he entered the Fine Arts School of the University of Costa Rica, where he obtained a post-graduate degree in fine arts specializing in painting. His artistic career has been developing in both painting and digital art, for which he has received numerous awards. In his art, Duran uses his passion for mathematics and science through a series of geometric abstractions. Using mathematical formulas, Duran generates surfaces and curves, transforming them into art through color and texture. The results are warm and bring a sense of natural balance and fluidity. Through these geometrically precise shapes, combined with gestured brushstrokes and random elements, Duran expresses our contradictory times finding balance and structure. Read more about Alonso in Landings Magazine, A.M. Costa Rica and Ancora. 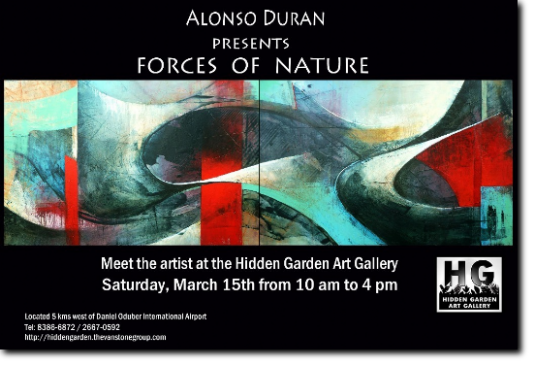 View the slide show from the opening of Alonso's "Forces of Nature," here.